This Classic Wedge Salad is both refreshing and super satisfying. 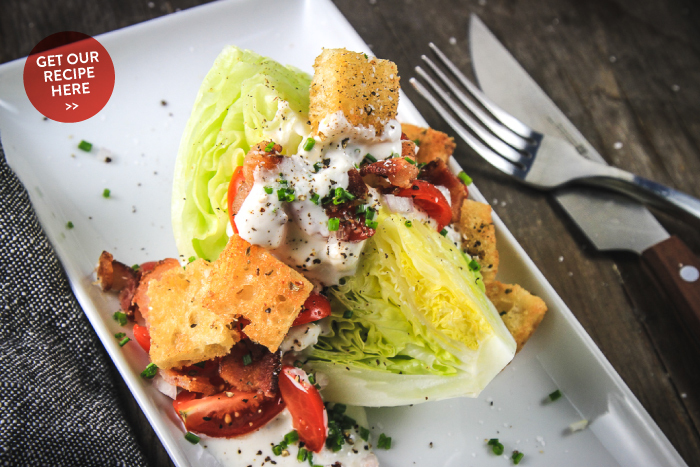 Dress a simple wedge of crisp iceberg lettuce with a rich homemade blue cheese dressing, crispy bacon, ripe tomatoes, and buttery croutons. 1. Prepare the blue cheese dressing by combining all ingredients except the fresh blue cheese crumbles in a small food processor and process until smooth. For a chunky blue cheese, add in the crumbles. For a smooth blue cheese, pulse the blue cheese into the dressing. Keep the dressing well sealed and refrigerated until ready to use. 2. Prepare the croutons. Preheat the oven to 375 degrees F. Line a baking sheet with parchment paper or aluminum foil. Toss the bread cubes with melted butter, garlic powder, kosher salt, pepper, and Italian seasoning. Spread the croutons in a single layer on the baking sheet, and bake for 12-15 minutes (turning once) until crispy and edges slightly browned. Let cool completely. 3. Assemble the salad. Crumble the cooked bacon. Wash and cut the iceberg lettuce into wedges, removing any loose outer layers. Quarter the grape tomatoes, and mince the chives. 4. Layer the salad. Prop up the wedge on a salad plate, drizzle with the homemade blue cheese dressing. Layer on the toppings: bacon crumbles, grape tomatoes, croutons, and generously garnish with the chives. Serve while still well-chilled.